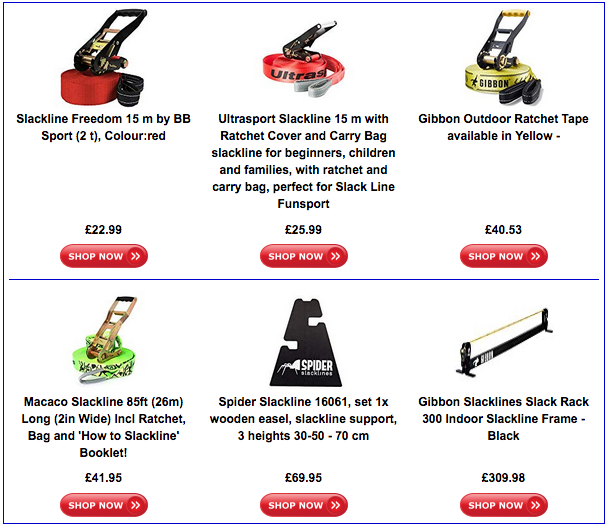 Please ensure that you follow the manufacturers safety instructions when setting up and using your Slackline. If the equipment is not used correctly, it can be dangerous. For more safety tips, refer to our Safety page. The health benefits that can be achieved from regular Slacklining sessions are very positive. The first point that should be highlighted is that the Slackline is extremely addictive. So, if you are a parent who cannot get their kids away from the Internet & Video games. Or someone who is losing motivation to go to boring gym sessions to try and burn fat and build muscle. Then it really is time that you invested in probably the most fun piece of fitness equipment that you will ever own. 1) Increase in core strength. 2) Improved concentration and mental focus. Many Slackliners compare the feeling while balancing, walking or tricking on the line to the feelings that arise from meditation. 3) Toning of lower body, calves, thighs, buttocks, hips when simply balancing and walking on a standard line. Effectively very similar to a Yoga session. 4) Additional toning of upper body, chest, arms, shoulders when performing certain tricks on a Trickline. 5) Burning calories whilst having fun! Additionally there are big social benefits to setting up your line in a public place such as a beach or park. We have yet to have a Slackline session where we didn’t meet new people who just walked over to us and introduced themselves asking if the could try our line. Clubs and events are becoming more and more popular all over the country and in fact the World. Experienced Slackers are always keen to help newcomers with advice for improving balance and tricks. Another huge benefit is that this is a cheap and environmentally friendly sport to practice. Once the initial equipment has purchased then that is it, there are generally no other costs involved at all. So if you want to meet open-minded, energetic and enthusiastic people then this is a great community to become a part of. Follow our Facebook page for details of more social events and Slackjams.